The Tanoshiboy Chronicles: Design & Illustration Blog: Guano see what I drew? Guano see what I drew? I drew this guy the first time, about 10 years ago. I remember the distinct day too, which is weird and I'm not sure where this came from, but he became a little sketch on a small piece of paper. I kept it and held onto it for years. It was in my office for a number of years just floating around. I always liked it, but I never did anything with it. 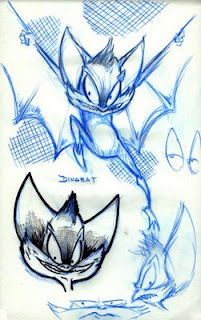 Anyhoo, I saw Coraline this past weekend (it was great by the way) and some of the charcaters in the flick were skottie dogs with bat wings. The image of those things brought to mind this little guy again, which is amazing in and of itself. I think I found a place for this guy, but I gotta further explore this guy and the story behind him. Anyway, enjoy.